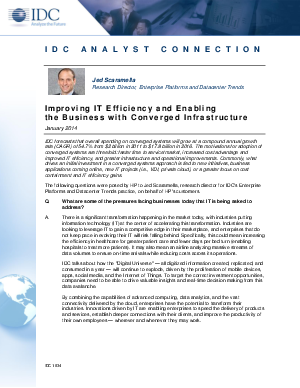 IDC forecasts that overall spending on converged systems will grow at a compound annual growth rate (CAGR) of 54.7% from $2 billion in 2011 to $17.8 billion in 2016. The motivations for adoption of converged systems are threefold: faster time to service/market, increased cost advantage and improved IT efficiency, and greater infrastructure and operational improvements. Commonly, what drives an initial investment in a converged systems approach is tied to new initiatives, business applications coming online, new IT projects (i.e., VDI, private cloud), or a greater focus on cost containment and IT efficiency gains.